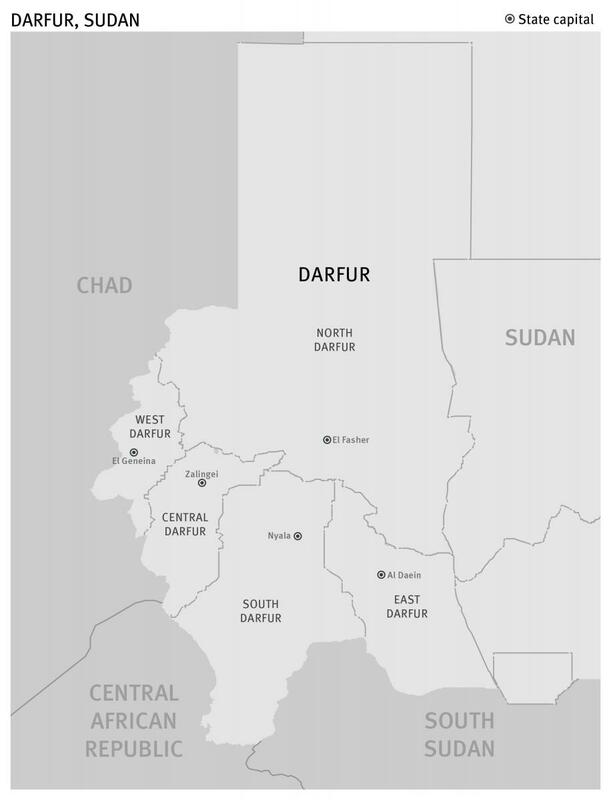 Map of Darfur from Human Rights Watch. Tens of thousands of civilians are fleeing central Darfur as a result of attacks eerily similar to those committed over a decade ago in the west Sudanese state. The Archive’s Genocide Documentation Project continues to pry loose records on the 2003-2004 Darfur genocide, and the results of our targeted FOIA requests provide a basis for understanding the ongoing tragedy, and raise prescient questions about the need for intervention more than a decade later. Marta Ruedas, a top United Nations humanitarian official in Sudan, recently said that she was “deeply concerned about the plight of more than 85,000 newly displaced civilians” as families flee from the escalating conflict in the Jebel Marra region of central Darfur. The forces of the Sudanese regime under President Omar al-Bashir, indicted by the International Criminal Court (ICC) on charges of genocide in March 2009, continue to carry out mass atrocities in the war-ravaged western region of Sudan. A 2015 Human Rights Watch report found Sudanese government forces committing extrajudicial killings, mass rapes, and torture of civilians. The recent attacks are similar to those committed over a decade ago. The Darfur genocide began in 2003 and, despite international condemnations and sanctions, violence against the civilian populations from the Fur, Zaghawa, and Masaalit ethnic groups by Sudanese government forces and militias continues with few signs of abating. Current reports of mass atrocity in Darfur should not come as a surprise to the U.S. government and the international community. The Genocide Documentation Project is in the process of collecting declassified government documentation pertinent to the Darfur genocide and there are reports of nearly identical atrocities from as early as 2003. Excerpt from December 11, 2003, cable warning of “Arabization” of Darfur. The language used in the cable insinuates that ethnic cleansing of the African tribes in Darfur was a priority for the Government of Sudan. The National Geospatial-Intelligence Agency (NGA) released satellite imagery to the Archive in 2006 that reveals how quickly the conflict escalated after these early warnings, and the amount of destruction it wrought within a matter of months. In an aerial photo from January 2004 a village in Darfur is labeled as “undamaged.” However, right beside it, an image captured in April 2004 shows the village has been completely destroyed. 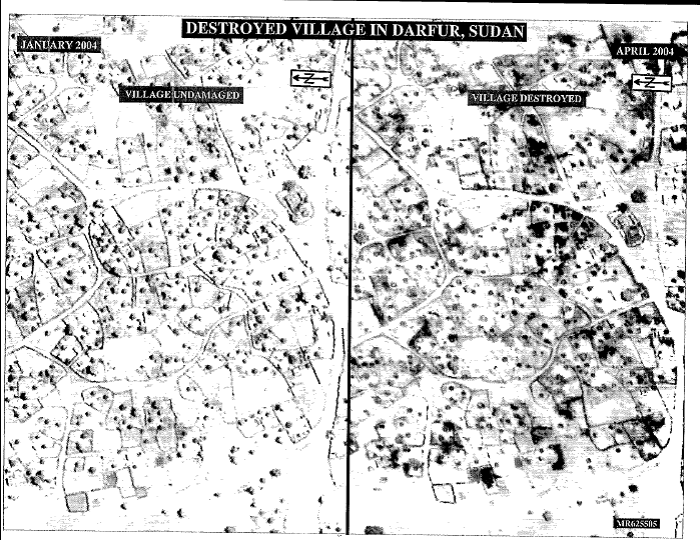 Satellite imagery of a village in Darfur before and after attacks between January and April 2004. Nearly a dozen similar images show how rapidly forces destroyed local villages, burning homes to the ground and displacing thousands. 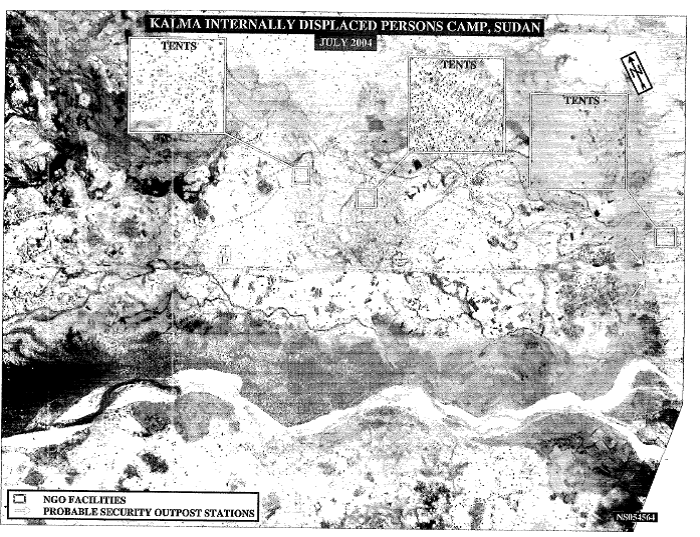 Imagery of the Kalma Internally Displaced Persons (IDP) Camp shows the growth of displaced families living in tents in the area, coinciding with the destruction of the Darfur villages. Satellite imagery from July 2004 shows the rapid growth of IDPs in camps. Excerpt from March 6, 2004 cable illustrating the Government of Sudan’s complicity in Darfur attacks. It wasn’t until September 9, 2004, that U.S. Secretary of State Colin Powell declared the atrocities in Darfur a genocide during a hearing before the Senate Foreign Relations Committee. 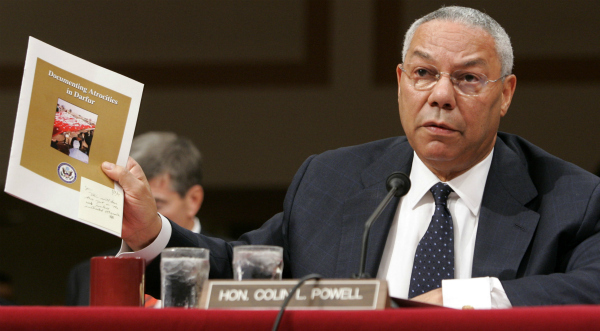 Powell declares Darfur a genocide. Since 2004, at least 300,000 people have been killed in the Darfur genocide. Documentation released to the Archive attests to longevity and severity of the crisis, and provides a solid foundation for advocates arguing for intervention 12 years later.